(Bloomberg) -- Sweden’s central bank committed to a plan to raise interest rates this year and dropped a mandate that had allowed policy makers to intervene in the currency market to help drive inflation higher. The krona gained on the news, after many in the market had expected the Stockholm-based Riksbank to signal a more cautious stance. The bank left the repo rate at minus 0.25 percent, as expected by all 19 economists surveyed by Bloomberg. The decision follows a December hike, which was the bank’s first in seven years. Sweden’s krona was trading about 0.5 percent higher against the euro as of 9:55 a.m. in Stockholm. “Growth abroad has slowed down, but economic activity will continue to be good over the next few years, with low unemployment and rising wage growth in many countries. There is still substantial uncertainty about the strength of the international economy,” the Riksbank said in its statement. 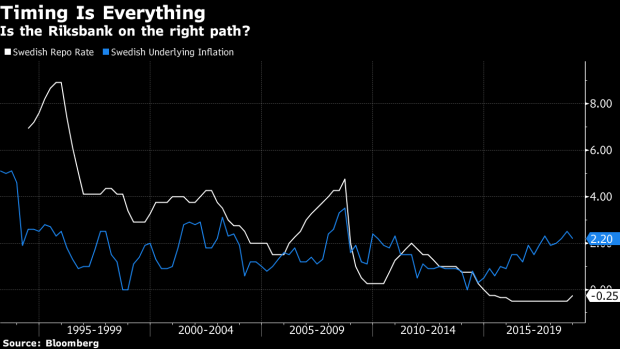 Policy makers in the biggest Nordic economy are adopting a wait-and-see approach as some of the world’s most powerful central banks retreat from earlier efforts to tighten monetary policy. In the U.S., the Federal Reserve appeared to do a U-Turn late last month, signaling it was putting its rate hikes on hold for now. In Frankfurt, speculation is growing that the European Central Bank will need to respond to the risk of a slowing economy by delaying any planned rate increases into next year. In Sweden, the Riksbank needs to weigh the need to move out of negative interest rates against the risk of a weaker economic outlook. Though inflation has reached the bank’s 2 percent target, there are concerns that wage growth won’t be strong enough to keep supporting prices. The development has prompted some economists to speculate that the Riksbank may yet need to rely more on a weaker krona in order to fan import prices. Over the past half decade, Sweden’s currency has lost almost 20 percent against the euro. Economists at Danske Bank have warned that the persistent exchange-rate weakness could be “devastating” for the Swedish economy. --With assistance from Rafaela Lindeberg.